At the beginning of the 20th century the toy industry was heavily rooted in German manufacture, as it had been throughout the 19th century. Despite this, there were several well-established businesses flourishing in Britain; G&J Lines of London had been a leading British toy manufacturer since the 1870s, JK Farnell was making soft toys and William Britains was making its renowned sets of toy soldiers. Chad Valley made board games and WJ Bassett-Lowke was the firm responsible for bringing accuracy of detail to model train manufacture. The toy business was conservative by nature; toys which had been popular at the end of the Victorian era remained firm favourites until the outbreak of the First World War in 1914. Among these were clockwork toys, dolls’ houses, spinning tops, magic lanterns, push and pull toys, puzzles, toy cookers, rocking horses and dolls, all of which were sold through department stores and mail order catalogues. The new century brought with it two new toys which were to become phenomenally successful. 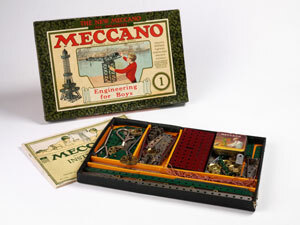 The first of these, Meccano, was designed by Frank Hornby in 1899 to encourage his sons’ interest in mechanical engineering. Originally patented as Mechanics Made Easy in 1901, Hornby changed the trade name of this new construction toy to Meccano in 1907. The industrial advances of the previous century had made educators aware of the importance of encouraging technical training for young men and the advantages of this toy as an instructive and amusing hobby were very clear. 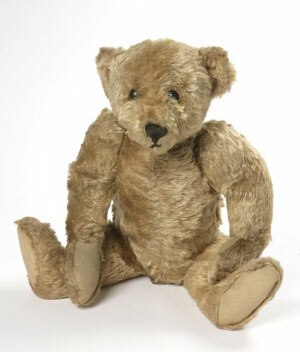 The second of the new toys, designed by Richard Steiff in 1902, was the first soft toy jointed bear, which became known by its familiar title, the teddy bear, from 1906. The word teddy became associated with the toy bear after an incident involving Theodore (Teddy) Roosevelt, President of the United States, while he was out hunting bears in Mississippi in 1902. With no bears to be found, his staff found a small cub and brought it to him to shoot. He refused, and a cartoonist from the Washington Post newspaper drew a cartoon of the episode. The cartoon bear proved very popular and was frequently used in subsequent cartoons about the President, becoming known as ‘Teddy’s bear’. During the First World War (1914-1918) imports from Germany were banned and the British government encouraged industry at home to make the toys that the Germans no longer supplied. This not only helped the economy to flourish but also provided work for servicemen returning from the war. Several small businesses were set up, including Lord Roberts Memorial Workshops and the East London Federation Toy Factory, which was founded in Bow in 1914 by suffragette Sylvia Pankhurst. The firm made soft toys and dolls designed by artists and changed its name to Ealontoys Ltd in 1948. Three brothers, William, Arthur and Walter Lines, the younger members of the Lines family who had worked in the G&J Lines factory before the war, decided to open a separate business and in 1919 Lines Brothers was launched. The two companies worked independently until G&J Lines closed in 1931. The new firm devoted its energies to producing a whole new range of good quality ‘Strong English’ toys. 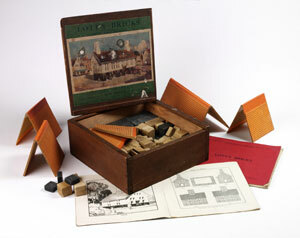 In 1918 EA Lott bought out Richter’s Anker toy building blocks and cut the bricks into shapes suitable for assembling buildings, selling them as Lott’s Bricks. The business really took off when Queen Mary bought the first box of Lott’s Bricks at the British Industries Fair in 1918. Queen Mary was hugely interested in toys, raising their profile by giving them as gifts to museums, including the V&A Museum of Childhood.